Two expressions that I really don’t feel comfortable with are “too posh to push” and “yummy mummy”. With almost 1/3 of women in Irish hospitals giving birth via C-section currently, the majority aren’t “too posh to push”, rather they have either had a breech baby which didn’t turn or they were on the last step of failed / lengthy inductions and a C-section was the last step to safely deliver baby. There is so much that I could write about that last sentence but today I want to focus on the breech baby side of things. Why does this work? In a nutshell you are: a) Helping the baby stay out of the pelvis, and b) Helping the baby to tuck his or her chin so that baby is able to make the flip. If you aren’t used to getting into this forward-leaning position, then please get assistance to get into an inversion. Kneeling on a couch, walk your arms to the floor, head facing down. Come onto your forearms and tuck your chin towards your chest, resting your head and neck completely. Stick your hips and bum up in the air. This is also a good one to practice to get baby out of the pelvis. Lying on your back, bend your knees, bringing the soles of the feet to the floor. Ensure you have a few cushions to place under your hips and one under your head for comfort, or if you feel breathless. Raise your hips up above shoulder level. 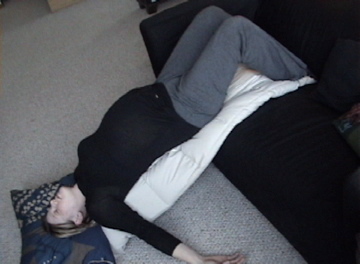 Try lying for about 10 minutes like this a few times a day. If you are up to it, you can also get into the position as show below – legs up onto a couch, lying on a plank. But please don’t attempt this unassisted. In traditional Chinese medicine, moxibustion is used on people who have a cold or stagnant condition. The burning of moxa is believed to expel cold and warm the meridians, which leads to smoother flow of blood and qi. In Western medicine, moxibustion has successfully been used to turn breech babies into a normal head-down position prior to childbirth. A landmark study published in the Journal of the American Medical Association in 1998 found that up to 75% of women suffering from breech presentations before childbirth had babies that rotated to the normal position after receiving moxibustion at an acupuncture point on the Bladder meridian. Other studies have shown that moxibustion increases the movement of the fetus in pregnant women. With those stats, I definitely recommend it! When to do it? Between 34-36 weeks ideally. Look for an acupuncturist with experience in this field/women’s health. So, I think baby has flipped, what now? Well stop doing the inversions for a few days and go for plenty of strong walks, then RELAX and trust your body and your baby! (pictures courtesy of spinningbabies.com).